I LOVED making this card!!! When I purchased the Bundle, I did think to myself "there is no way I'll ever use that" ! Well, when I saw a similar card on Pinterest, I knew I had to make it. 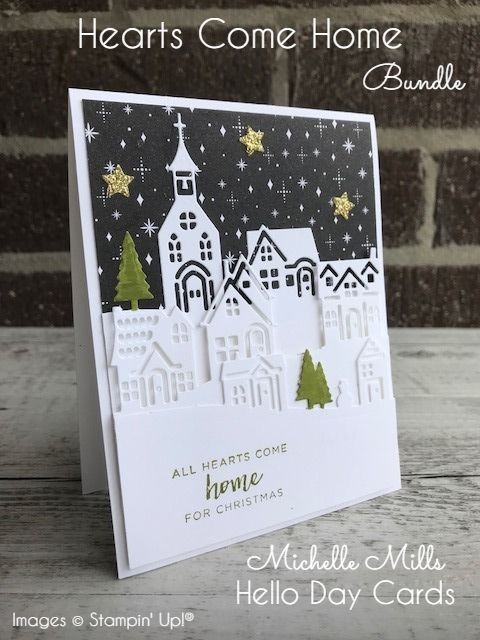 I CASE'd this card from one I saw on Pinterest made by Rachel Woollard. I have changed it up a little bit from Rachels...my building line is a little different from hers, I took a set of trees out as I thought it was too crowded and I have also used a different sentiment. I chose stars for the sky as well rather than a Santas sleigh. I have however used the same designer paper for the background of the night sky. I love how this card turned out and surprisingly, it wasn't all that difficult to put together. You just have to make sure you keep lining everything up before you secure it down on the card.